Polar Satellite Launch Vehicle (PSLV-C42) of Indian Space Research Organisation (ISRO) lifting off from the Satish Dhawan Space Centre (SDSC) SHAR, Sriharikota, Andhra Pradesh on September 16, 2018. The satellites belong to UK-based Surrey Satellite Technology Limited (SSTL), which has a contract with Antrix Corporation Ltd, the commercial arm of ISRO. NovaSAR carries S-band Synthetic Aperture Radar (SAR) and an Automatic Identification Receiver payloads. The satellite applications include forestry mapping, land use and ice cover monitoring, flood and disaster monitoring and maritime missions. It will be operated from SSTL's Spacecraft Operations Centre in Guildford, UK. During the previous launch (PSLV-C41, April 12, 2018), the 'XL' version of PSLV with six strap-on motors was used. The vehicle successfully launched the IRNSS-1I navigation satellite to a Sub-Geosynchronous Transfer Orbit. The vehicle's guidance system is from ISRO's Inertial Systems Unit, Thiruvananthapuram, while SDSC SHAR was responsible for solid motor preparation, vehicle integration and launch infrastructure. ISRO's Telemetry Tracking and Command Network provided tracking support. "I am extremely happy that the PSLV-C42 precisely launched two of our customer satellites at 583 km orbit. This was unique night mission executed for the first time by us. 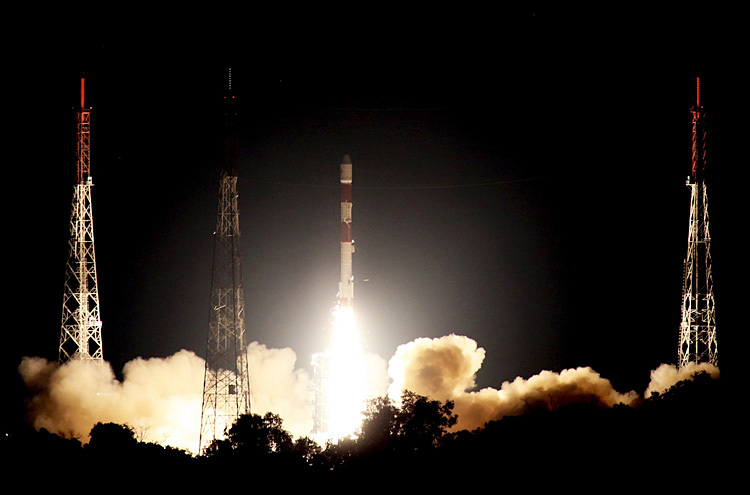 The PSLV has proven yet again as a user-friendly vehicle in all aspects. The credit goes to the entire ISRO team and industries. This success will give added energy for industries to make PSLV by themselves. We are going to have 18 missions in the next six months, virtually one launch every two weeks," Dr Sivan said. "The PSLV-C42 marks the latest technology and commercial collaboration between India and the UK with the launch of the combination of high resolution optical and radar (SAR) satellites from us," says Sir Martin Sweeting, Group Executive Chairman, SSTL.